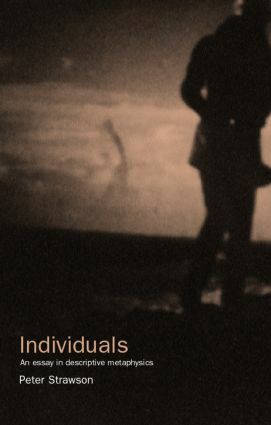 Since its publication in 1959, Individuals has become a modern philosophical classic. Bold in scope and ambition, it continues to influence debates in metaphysics, philosophy of logic and language, and epistemology. Peter Strawson's most famous work, it sets out to describe nothing less than the basic subject matter of our thought. It contains Strawson's now famous argument for descriptive metaphysics and his repudiation of revisionary metaphysics, in which reality is something beyond the world of appearances. P.F Strawson taught at the University of Oxford from 1947, becoming Waynflete Professor of Metaphysical Philosophy in 1968. He retired in 1987 and is now Honorary Fellow of Magdalen College. He is also the author of The Bounds of Sense: An Essay on Kant's Critique of Pure Reason, published by Routledge.